Use 2017 as an index of what to look for! Thank you in advance to the group of you participating in this thread and not just cherry picking results. Everybody has to pitch in for this to work. Cam Rock is like Deerfield. basically all that we can tell from those results is people ran in Cambridge today. Cam/Rock is most definitely short. One of the schools I coached at had their top 15 times in school history at that course. No disrespect to East Troy however. They do appear to be a legit team, as everyone expected. Observations: Traditionally a slower course, and this year was wet and sloggy, but temperatures weren’t bad for running. A lightning strike 3 min. before the start delayed it 30 min. Boys and girls raced together in light rain. CF McDonnel boys and girls teams look D3 solid, both look like contenders to make it past sectionals. McDonnel boys go 1-2, and girls winner Savannah Schley (Loyal-Greenwood) clearly one of the better D3 girls in the region. Chippewa Valley (3rd place boys and girls teams) is a composite team/club of area small Christian schools and home school runners. Competes in area races, but runners do participate in or are considered an official team for WIAA state qualifying events. Most teams competing here will also be at the Stanley-Boyd invite next Thursday. 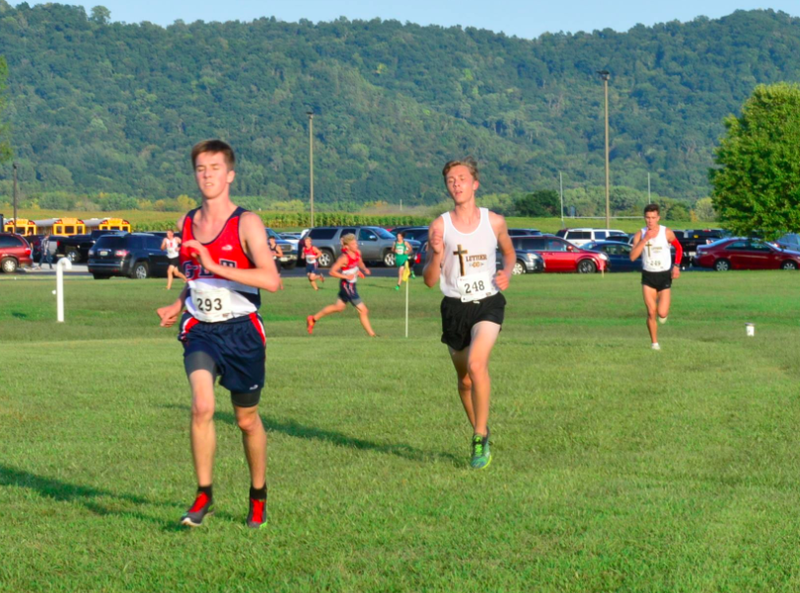 GET’s Doug Feyen leads Luther’s Sam Larson at 3200 meters. I don’t know what sectional they’re in. How do you rate the Luther girls’ chances this year? @AnakinFavre, Luther is in the Durand Sectional. I am no expert on girls cross county or boys for that matter. However, just my personal observations regarding some of the Luther girls are: 1) I haven’t seen many runners give more effort than Cianna Hoppe gives every race I’ve ever watched her run. Her best distance is probably the 800m. 2) Lizzie Stuebs surprised me with the jump in performance she made this year compared to last year, she will be battling for the Luther #1 position all season long. 3) Julia Strangeman wasn’t on my radar at all. I first noticed her performance at the Westby Invitational. She looks like a distance runner and is only a sophomore. Luther’s #4 runner, Makayla Hansen, is also a sophomore. Last track season Emily Wintrone was the lone Luther distance girl who went to state in the 1600. She pr’d at state in 5:35.32 (12th) after a pr at sectionals 5:39.14. She is a talented athlete who is a very good volleyball/basketball player. Unfortunately she isn’t on the cross country team. The lady Knights have been exciting to watch this season! Cooler at Neenah than it has been in years, but still warmer than I’d like. Word on the street is that Mienke is not running tonight. SPASH should have handled the boys side. Would say those times look nearly a minute fast for this early. To have school records on a course you know is way off is just deluding yourself into glory. Certainly the course record is still a record but for personal and school records come on now get serious. Years ago at the old Chocolate City course a chunk of my guys had “PR’s” and I did not have my wheel along to verify. On the next sunday I drove the 90 miles back down with my wheel and wonders never cease the course was over 100M short so no school records or personal records at that one. Same with the old Black Hawk at Janesville before recent coaches refined the course to a reasonable accuracy. Now these results look realistic. Giftos is a 16:09 guy from last year and is supposedly running 30 seconds slower than the guys from Cam/Not. Definitely Cam is Not 5K.